In honor of the 50th anniversary of the Apollo 11 mission to the Moon, the William M Thomas Planetarium will show the newly-arrived shows Future of Space Exploration and Journey to Mars on Thursday, April 25, from 7:30-8:30pm. Doors will open 30 minutes before the show starts for seating and will be closed during the one-hour program with no late admittance. Tickets will be available for $8/adults and $6/seniors and children 5-12 years old from the Bakersfield College Ticket Office or online only starting March 29 (tickets will NOT be sold at the door). The BC Ticket Office is in Business Services (661-395-4326) and the William M Thomas Planetarium is on the second floor, northwest end of the Math-Science Building, Room 112. The map below shows you where the ticket office and the planetarium are. No food, drink, or gum/candy is allowed in the planetarium. Children must be 5 years or older. The one-hour show will begin with a short tour of the evening sky using the planetarium's Goto Chronos star projector followed by the two eleven-minute all-dome presentations from NASA called The Future of Human Space Exploration and Journey to Mars. These shows describe our nation's next steps in exploring space, establishing a base on the Moon and eventually walking around on Mars. How will we develop the experience and technology to survive on the red planet? These shows will describe it in full-dome imagery. 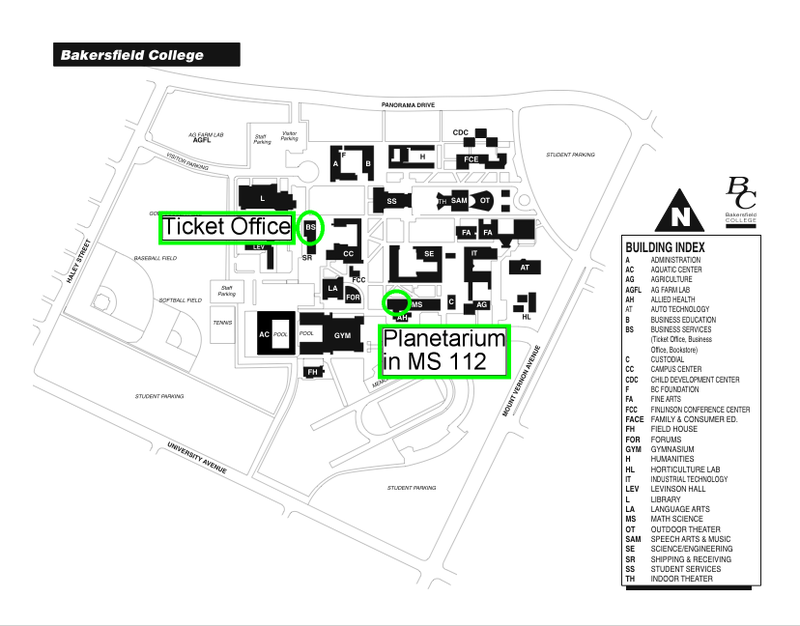 Also see the map section of the website for a more detailed map to the planetarium, disabled access and driving directions.